BOCA RATON, FL — The U.S. Postal Service invites the public to its national First-Day-Of-Issue (FDOI) Hanukkah stamp dedication ceremony at 11 a.m. on Tuesday, November 1, at Temple Beth El of Boca Raton, 333 SW 4 Ave, Boca Raton, FL. The public is asked to share the news of the stamp dedication using the hashtag #HanukkahStamps. Joining U.S. Postal Service Chief Operating Officer/Executive Vice President David E. Williams in dedicating the stamp will be Rabbi Jessica Brockman, Senior Rabbi Dan Levin and Rabbi Greg Weisman of Temple Beth El of Boca Raton. U.S. Postal Service South Florida District Manager Jeffery Taylor will serve as Master of Ceremonies. On November 1, the Hanukkah stamp will be available for purchase at the temple and at Post Offices nationwide. Also at the temple, other related philatelic products will be available for sale in the Social Hall adjacent to the Sanctuary where the FDOI ceremony will be held. Official FDOI programs will be distributed to all those who attend. Following the dedication, all FDOI ceremony participants will be at a table for guests to have their programs autographed, if they wish. 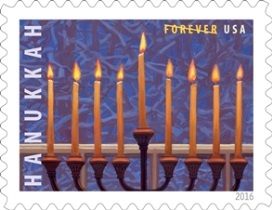 The Hanukkah stamp depicts a warm, elegant illustration of a holiday menorah in the window of a home. The white window trim is visible through the branches of the menorah, which echo a tangle of snow-covered tree branches beyond the glass. ArtistWilliam Low added visual interest to the scene by highlighting the contrast between the hot candle flames and the cool snow, the vertical candles and the horizontal window frame, and the dark menorah with the brightly lit candles. Low, of Huntington, NY, worked under art director Ethel Kessler of Bethesda, MD, to design the stamp.